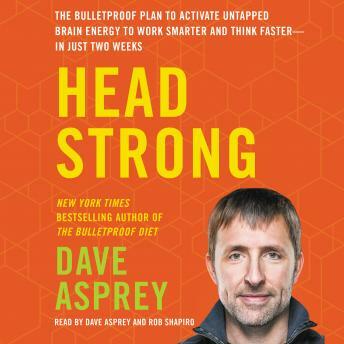 For the last decade, Silicon Valley entrepreneur Dave Asprey has worked with world-renowned doctors and scientists to uncover the latest, most innovative methods for making humans perform better—a process known as 'biohacking.' In his first book, The Bulletproof Diet, he shared his biohacking tips for taking control of your own biology. Now, in Head Strong, Asprey shows readers how to biohack their way to a sharper, smarter, faster, more resilient brain. Power the brain with exactly what it needs to perform at its best all day longEliminate the sources of 'kryptonite,' both nutritional and environmental, that make the brain slower.Supercharge the cellular powerhouses of our brains, the mitochondria, to eliminate cravings and turn up mental focus.Reverse inflammation to perform better right now, then stay sharp and energized well into your golden years.Promote neuron growth to enhance processing speed and reinforce new learning—hotwiring your brain for success.Asprey’s easy to follow, two-week program offers a detailed plan to supercharge brain performance, including: which foods to eat and which ones to avoid, how to incorporate the right kinds of physical activity into your day, a detox protocol for your home and body; meditation and breathing for performance, recommended brain-boosting supplements; and how to adjust the lighting in your home and work space to give your brain the quality light it thrives on. Very helpful and loaded with great tips. Also things you do not hear elsewhere like the influence lighting. Of Course, Davey tries to sell us his supplemental products which he truly believes are the best products and he is probably right + you just gotta love this guy so you don't even consider to buy from others. We want more, we want more! Very well researched book. If a point is made that is an opinion or personal experience the author is very clear it is not supported by research. I found some sections dragged a little (same point made several times) but overall a very compelling read. Definitely recommend looking to improve their minds function or health overall.